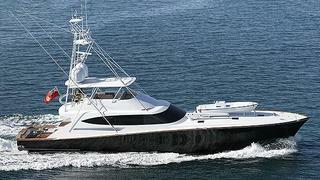 Allenby & Associates announces a $955,000 price drop on the 27.4m sportfish superyacht for sale Satu. Launched by New Zealand superyacht builder Yachting Developments in December 2012, the yacht features design by Ullberg Yacht Design & Engineering and interior design by Robinson Marine. She features Japanese ash wood joinery and wenge wood floors in an interior that accommodates six guests in a master, double and twin cabins, plus accommodations for crew members. Powered by twin 2,400hp MTU 16V 2000 CR engines – housed in a Van Cappellen-designed engine room – Satu can race to the prime fishing grounds in no time, topping out at 33 knots and cruising at 30 knots. She also boasts a 2,600 nautical mile range and is designed to allow her owner to be self sufficient for many months on end. Fully outfitted for fishing, Satu carries a custom Bausch American full tuna tower with a buggy style hardtop. Satu is now down from her previous price of $9,950,000 and is currently for sale asking $8,995,000.